Each morning, a stunning sunrise welcomes you to this pristine paradise and gives way to the tropical sun. The quiet bay comes alive with the warm breeze, the sound of the ocean waves, and the incredible variety of wildlife.The facilities at Talalla Retreat are second to none. Well appointed rooms, excellent food, fresh juices, a large swimming pool, and the sprawling common areas are all yours to enjoy. We also have a very skilled team of massage therapists and a wide variety of indulgent spa treatments. Our 4 open air yoga shalas are equipped with everything you need including mats, blocks, blankets, straps, and bolsters. We also have projectors and sound systems would you wish to utilise these for your teachings. 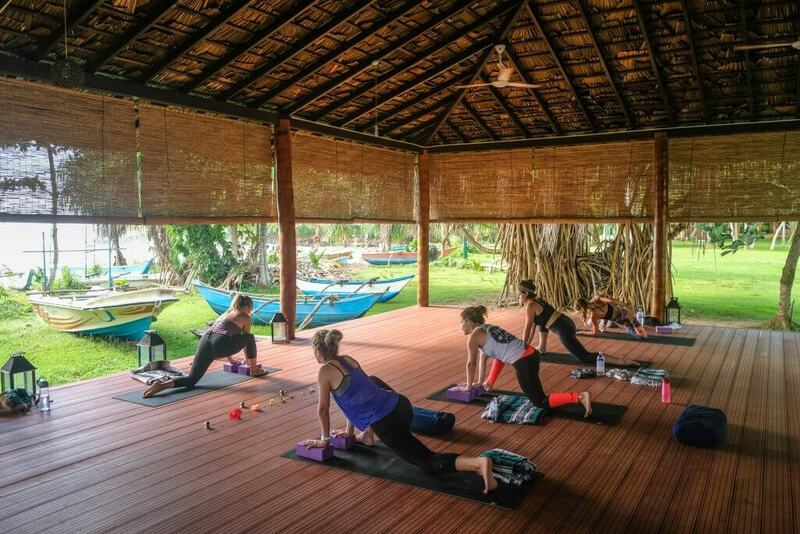 Our 7 Day / 6 night Yoga Retreats at Talalla are designed with you in mind. We offer 4 x weekly Yoga themes to choose from, as we are committed to making yoga accessible, fun, and safe for everyone. We welcome everyone from beginners to advanced practitioners to join us. We inspire, care, and create an atmosphere of discovery and possibility for all participants. All you need is your deep breath! You will love your time here! Namaste! Looking for a further variety to deepen your practice and expand your fitness regime? 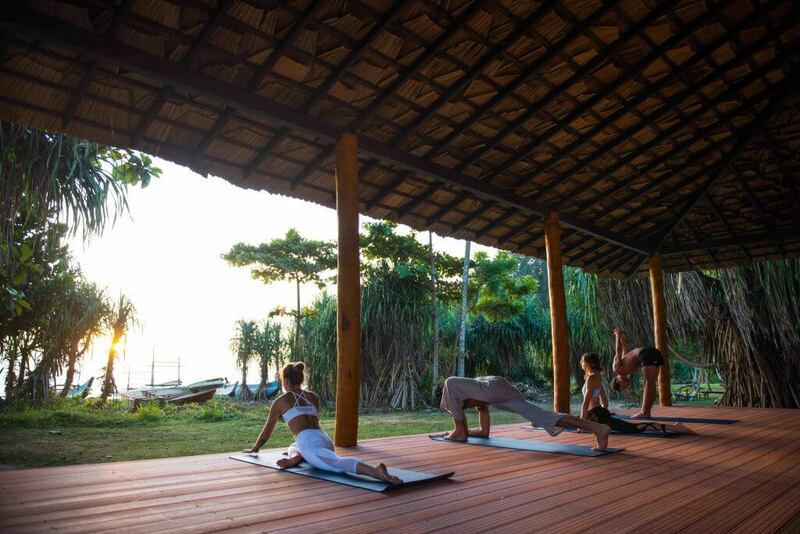 We also host 7 Day / 6 Night Wellness Retreats here at Talalla, offering Yoga but also a balanced weekly break including a mix of Pilates, Boxilates, Surf Lessons, Postural Workshops, Safari Tours, Local Cooking Classes, 1:1 Private consultations and local excursions! Head to Talalla Wellness for all the details. Join our daily drop-in yoga classes in at Talalla Yoga! We offer energising Vinyasa Flow in the morning from 7:30am – 9:00am and relaxing Restorative/Yin Yoga in the evening from 5:00pm-6:30pm. We have recently introduced FlyHighYoga Aerial classes to explore your practice even further! The cost for all classes is USD $15 per student per class including mats, blocks, bolsters and straps. Bring yourself and a bottle of water, and dress in comfortable clothes. Please see reception upon check-in for further information. Our Yoga Instructors tailor our classes to all experience levels; offering both modifications to simplify yoga poses and advanced variations so that all levels attending can benefit and grow in their practice. Please check our Facebook Page and Instagram for weekly special workshops and schedules! Classes are available for guests staying at Talalla Retreat, outside guests are welcome in non-peak season (May – Nov) by purchasing a meal in our restaurant or a spa treatment. Specialty Workshops: Occasionally our teachers will also offer drop in specialty workshops with topics ranging based on our teachers special interests. Topics may range from Introduction to Meditation, Sound Healing, Myofascial Release, Partner Yoga and more. Check our weekly schedule once you arrive, our Facebook Page and Instagram or email us for more information. Private Classes: Something special we offer here at Talalla are 1:1 private classes with our resident teachers. All levels of practice can benefit from individual attention often difficult to receive in a class setting. Whether you are a beginner wanting to understand better body mechanics and alignment or advancing towards poses like headstand and want feedback, book a one on one with us! 60 min session is USD $50. Karma Yogis: We love to open up our space and invite Karma Yogis to join the team, usually on a one month base. Karma yoga is one of the main paths of yoga that a practitioner can follow. The name comes from the Sanskrit term meaning “action” or “deed.” Therefore, it is the path of action, or selfless service towards others. It is considered by some that practicing karma yoga is the most effective way to develop spiritually. Please email us at [email protected] for upcoming positions.